2000 AD is pleased to announce that the second 2000 AD Extreme Edition will be published on Wednesday 10 December, priced £2.99. 2000 AD Extreme Editions are brand new quarterly publications showcasing classic stories from the Galaxy's Greatest Comic. Each 100-page edition is themed round a specific character or concept (the first edition collected a number of rare Judge Death stories), and contains a selection of definitive takes on that subject from legendary 2000 AD creators. Extreme Edition 2: Definitive Maybe, collects every strip from 2000 AD featuring juvie homicidal genius PJ Maybe. 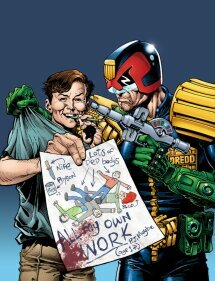 Maybe, heir (by a process of elimination) to the fortunes of Mega-City One clothing company Emphatically Yess, suppliers of uniforms to the Justice Department, has been a perennial thorn in Dredd's side. Hiding his devious, murderous urges behind the façade of a none-too-bright child, Maybe managed to hide his activities from old stony face for longer than many a notorious MC1 criminal, and even on the occasions when he has been caught, he has been able to turn his mind to ingenious methods of escape. And of course, being a methodical young man, he writes down his achievements in his diary. 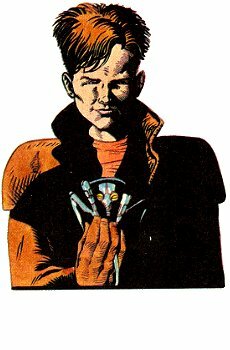 PJ Maybe was created by veteran 2000 AD writers John Wagner and Alan Grant, and artist Liam McCormack-Sharp, and over the course of nine 2000 AD stories, the character has seen contributions from writer Garth Ennis and artists Anthony Williams, Peter Doherty and Ben Oliver as well as the original creators. Extreme Edition 2 collects every one of these appearances behind a brand new cover image by Cliff Robinson. 2000 AD Extreme Editions 2: Definitive Maybe will be on sale from 10 December, priced £2.99 from all good newsagents and comic shops. Direct retailers can obtain copies of the magazine from Diamond, while news trade should contact Seymour Distribution.